An exchange between Giovanni Rubino and Aria Spinelli with input from Migrant Workers Education Group and Proyecto Sur. On 6th March, MayDay Rooms will host a discussion between the Milan-based Italian artist, Giovanni Rubino and independent curator and researcher, Aria Spinelli. This exchange will link a long-term collaborative research project investigating the history of radical art in Milan in the 1970′s with current forms of workers’ struggle in Britain and the role of what might be called ‘artistic strategies’ today. This latter will be addressed by members of the Migrant Workers Education Group and a Chilean representative from Proyecto Sur (tbc). Giovanni Rubino came to prominence as part of the Italian social art movement, so called after its main artists were represented at the Italian Pavilion for the 1976 Venice Biennale. 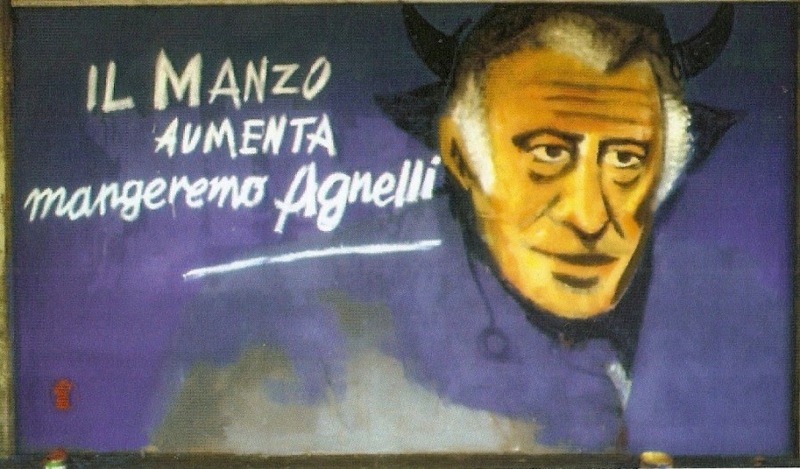 He is well-known for his political wall paintings, such as Il manzo aumenta mangeremo Agnelli (Milan, 1974) or Murales per Rocco Gatto (Gioiosa Ionica, 1978), which seek to collectivize the memory of key moments of social resistance. His mode of artistic and situationist intervention, often undertaken in collaboration with blue collar workers, was influenced by Italian workerist social movements of the 1960s and 1970s such as Lotta Continua, Potere Operaio and Autonomia Operaia. Rubino and Spinelli will discuss three of the artist’s major projects: Mortedison, 1973 (a public action against pollution at the Edison Factory in Porto Marghera, Venice); La Mostra Incessante per il Cile [The Incessant Exhibition for Chile], 1973-1976 (a series of exhibitions uniting Italian and Chilean artists, convened in order to apply pressure to Pinochet’s government) and the Alpha wall paintings at Arese, 1978 (a set of murals documenting Alfa Romeo’s workers’ strike in the town of that name). In all three cases, Rubino’s inclusive attitude and widespread interests are grounded in his outspokenness about social injustice and inequality; his dissent towards all forms of social coercion. Rubino’s experience offers an important insight into the multifaceted atmosphere of the very specific and local history of Milan during one of the most violent and transformative periods of Italian social history. This exchange hopes to bring forth a discussion about how modes of artistic intervention such as Rubino’s can transcend their specificity to inform and embolden current artistic strategies in relation to workers’ struggle. Alberto and Marlenis from the Migrant Workers Education Group along with a representative from Proyecto Sur will update the account by addressing the continuation of this struggle from the position of migrant workers. Given the recent ‘noise’ protests during the BAFTA awards ceremony at the Royal Opera House, the Boalian Theatre outside corporate buildings and ongoing educational programmes self organised by Latin American workers – is it still useful to draw a distinction between artistic strategies and workers’ struggle? Maybe tonight we can begin to redraw some of those lines of specialisation and modes of practice to reflect what might be called a new phase of struggle? March 6 @ 6:00 pm - 9:00 pm - MayDay Rooms, London. To signup for the event please go to.